2. The GUI and event handling setup should be done in the constructor of your GUI class or in private methods called from the constructor. 3. The display must have a label and JTextField where the user inputs a value which must appear in the upper part of the frame as shown above. 4. There should be a set of 3 radio buttons which indicate the input scale of the value to be converted. The 3 input scale buttons must be vertically aligned on the left side of the display as shown above. 5. There should be a set of 3 radio buttons which indicate the output scale to be converted to. The 3 output scale buttons must be vertically aligned and appear on the right side of the display as shown above. 6. Event handling must be setup so that selection of any input or output button causes an event which triggers the event handling code to determine which of 9 possible conversions is needed. 7. Event handling must also respond to the user hitting the enter key in the input textfield! For this event, the event handling code must also determine which conversion is needed based on which buttons are selected. 8. Display the conversion result in an output text field or in a JLabel which appears in the bottom part of the display as shown above. Output the degree symbol and output scale information as shown above. You can output a degree symbol by putting the character value 176 into a formatted string. 9. If a radio button is clicked when there is nothing in the input textfield, the event handler must display the string “No Input” in the output textfield. 10. 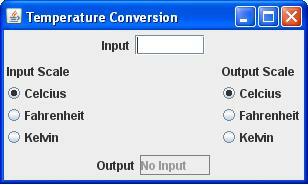 Your program must accurately convert from Fahrenheit, Celcius, Kelvin to Fahrenheit, Celcius, Kelvin. Only the selected conversion is displayed in the output textfield. 12. When the conversion selection changes due to clicking either an input or output scale button, the output area must change to show only the new result. 13. HINT: For radio button events, use the ItemListener interface and use the isSelected method on the radio buttons to find out which buttons are turned on! 14. The output must display 2 digits after the decimal point. Make sure that you test all your conversion formulas and the error case handling!!! Take screen shots of the program doing 2 different conversions and handling one of the error cases. Paste the screen shots and the source code for your program into a Word document.